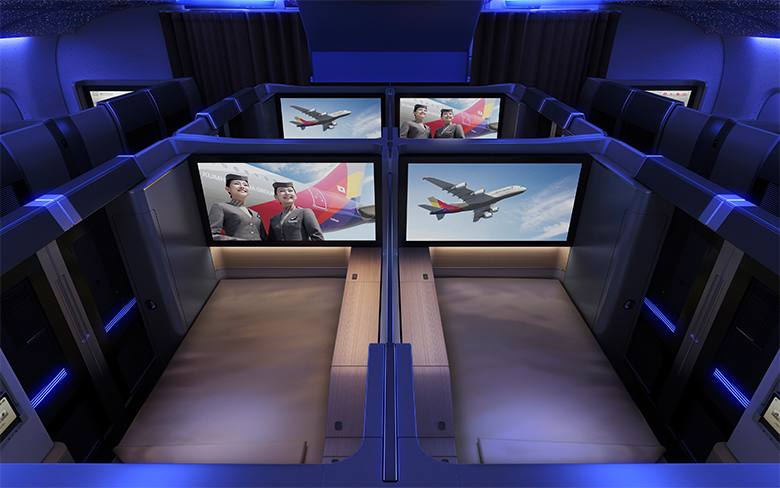 When the South Korean airline Asiana ordered six of the world’s largest passenger aircraft, the Airbus A380, they came to tangerine for advice on how to make the business and first class cabins look stunning. The brief, however, came with a significant geographical challenge. The first class seats were manufactured in the United States, the business class seats in France, the walls and galley were made in Japan and the bar and lounge area was created in Germany. The client was in Seoul and the aircraft would be assembled in Toulouse. Success with a project scattered across continents was going to require excellent communication, and with most of the interior elements fixed by the manufacturers, giving the design a sense of coherence and brand would need first class creativity. For tangerine, it was about strategic thinking, exhaustive inquiry and attention to detail. With the base engineering of the seats fixed, the tangerine team focused on improving the surfaces, the shapes and the height of the shell. Subtle adjustments resulted in significant design improvements. The front of the upper deck was transformed into a bar and lounge area, with cunning use of colour and finishes creating a sophisticated ambience. Members of the Seoul design team based themselves in London so they could be closer to the assembly process.